Our guide to San Diego will help you find the best frozen yogurt shops in San Diego California. Although San Diego is the eighth largest city in the country, it's stayed true to its laidback surfer vibe mentality. If you're looking for trendy boutique hotels, an exploding culinary scene, and big-city nightlife, with a side of beach bum mixed in, you're in the right place! For families, San Diego is ideal. If world-famous destinations like the San Diego Zoo, SeaWorld, Belmont Amusement Park, and LegoLand (in nearby Carlsbad) aren't enough, families can take advantage of an abundance of museums, a children's theater, a puppet theater, and all sorts of other, lesser-known but no less entertaining attractions. With this much to offer, it's no surprise that tourism plays a major role in San Diego's economy. Other big contributors include biotechnology, agriculture, manufacturing, and defense-related industries. The US Marines and the US Navy maintain several bases in the county. There are tons of great frozen yogurt shops in the city of San Diego, our city guide will help you find the best frozen yogurt shops. You may have a hard time deciding what to do in San Diego, but we make your decision easy. Ultra-hip yet minimalistic frozen yogurt in San Diego? I'd heard the hype. I'd been told of women milling around outside the frozen yogurt shops, waiting for them to open. There were reports of college co-eds running down the streets of Pacific Beach minutes before closing time to get their fix. 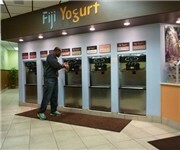 1010 University Ave, (619) 297-0850 - Fiji Yogurt is a frozen yogurt shop located in San Diego CA. 11828 Rancho Bernardo Rd, (858) 618-1125 - When people think frozen yogurt, they think Golden Spoon. That's because we offer the ultimate frozen yogurt experience. 1254 University Ave, (619) 299-7766 - When people think frozen yogurt, they think Golden Spoon. That's because we offer the ultimate frozen yogurt experience. 13215 Black Mtn Rd, (858) 484-8675 - When people think frozen yogurt, they think Golden Spoon. That's because we offer the ultimate frozen yogurt experience. 16588 Bernardo Ctr Dr, (858) 673-4204 - Yoberry Yogurt is a frozen yogurt shop located in San Diego CA. 16621 Dove Cyn Rd, (858) 485-9555 - Sweet Things Frozen Yogurt is a frozen yogurt shop located in San Diego CA. 3615 Midway Dr, (619) 223-7736 - The California Yogurt Company is a frozen yogurt shop located in San Diego CA. 3943 Governor Dr, (858) 587-1700 - The Place where you can feel bad about eating something so good for you!!!! 4545 La Jolla Vlg Dr, (858) 677-9228 - Yogen Früz provides delicious and nutritious frozen desserts, just what you need to live a healthy and active lifestyle. 5604 La Jolla Blvd, (858) 454-1945 - Bird Rock Yogurt Co is a frozen yogurt shop located in San Diego CA. 6165 El Cajon Blvd, (619) 287-9888 - Yogurtland offers a tempting blend of choices, image and value – a unique mix that's arrived at the perfect time. 711 4th Ave, (619) 696-7700 - We focus on satisfying our customers by providing nutritious, healthful, and luscious yogurt products. 7407 Jackson Dr, (619) 469-4492 - Yogurt Works is a frozen yogurt shop located in San Diego CA. 7610 Hazard Ctr Dr, (619) 260-1150 - Yogurtland offers a tempting blend of choices, image and value – a unique mix that's arrived at the perfect time. 855 Garnet Ave, (858) 581-1700 - Yogurtland offers a tempting blend of choices, image and value – a unique mix that's arrived at the perfect time. There are plenty more frozen yogurt shops in San Diego. See all frozen yogurt shops in San Diego California.